PST is a Microsoft Outlook file format used for saving users' mailbox data—such as emails, address books, calendars, notes, and tasks—on a local computer. PST files can help you archive mailboxes, back up critical data and restore it later, meet security requirements of compliance mandates, and migrate mailboxes from one Exchange server to another or to Exchange Online. 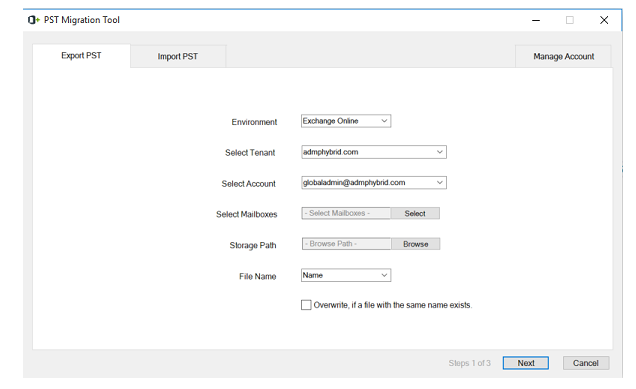 ManageEngine PST Migration Tool helps you export Exchange and Office 365 inboxes, contacts, and calendar contents to PST files. This free tool helps you easily import PST files to new Office 365 mailboxes. Mailbox size restriction: Email storage is often limited to enhance performance, reduce backup times, and facilitate smooth operations overall. PST files provide end users with a means of expanding their email storage by creating and maintaining one or more local archives. Backup and recovery: If you don’t have an email administrator who regularly performs backups of your email server, then exporting your emails to a PST file is a fast and easy method to ensure you can recover your mailbox data in case of any mishaps. Portability: PST files make email portable. You can move email from one mailbox to another, or keep your personal and work emails with you always by storing them in a USB drive to restore them at a later time. Why do you need a third-party tool? Without a third-party tool, exporting Exchange and Office 365 mailboxes requires expertise to apply the appropriate roles and permissions. PowerShell scripts are time-consuming: To export Exchange mailboxes, you can use PowerShell scripts, but doing so is painstakingly time-consuming, especially when you want to export mailboxes in bulk. Elevated permissions: For a user to export or import Exchange mailboxes, they have to be a member of a role group that has the Mailbox Import Export role added. 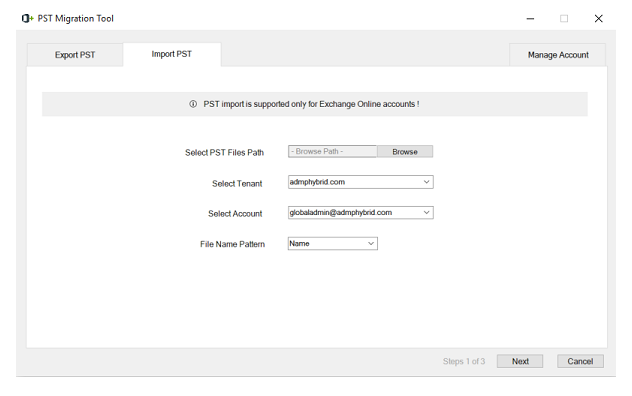 When it comes to Exchange Online mailboxes, a user needs administrative privileges to use the eDiscovery tool in the Exchange Online Admin Center to import or export PST files. Cost of license plans and add-ons: To use the eDiscovery tool, you need a licensed plan or you need to install add-ons to use features like archiving and In-Place Hold. What can you do with the PST Migration Tool? When should you use this tool? Are you on the verge of migrating your mailboxes to Office 365? 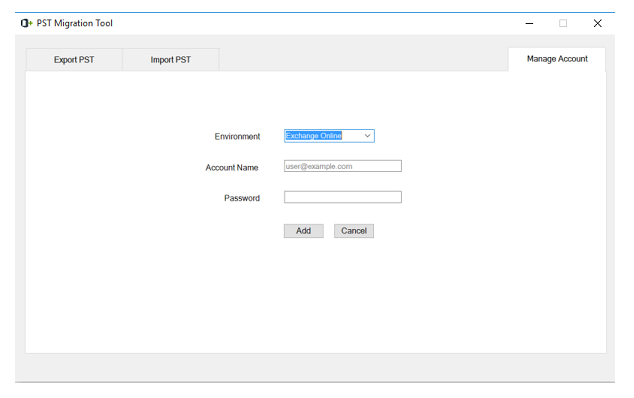 Use the PST Migration Tool to configure the user accounts with appropriate permissions. Need to migrate your inbox, contacts, and calendar to a new Office 365 mailbox? Configure your old Office 365 account in the tool, export the content to PST, and import the PST file to your new mailbox. Permissions required for importing and exporting PST files. To import a PST file: Read/Write permission. To export a PST file: Read permission.